At the Genoa Boatshow, the press had been invited at the MTU stand for a conference. 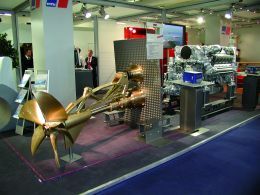 It appeared to be one like many of the conferences organized during the Boatshow, even more so because MTU had just been sold by the Daimler-Chrysler group to the Swedish financial company Wallenberg, changing its name to Tognum group. Instead, what Mr Christian Beiner, Vice President and Application Center Manager showed us appeared to be the most interesting and exclusive news of the Boatshow as well as an absolutely important novelty in the pleasure boating industry. For the first time ever, a complete propulsion package, from engine to propeller - including coupling and trim - is electronically controlled. MTU called this complete system "maritune", not quite an exotic name, rather a symbolical one. "Maritune" is the first package that deals with the vessel and the propelling unit as a whole. Until now, engine manufacturers have concentrated their efforts, their research studies as well as their technological innovations on optimizing either the engine or the drive. All the variables existing when the vessel is under way and which depend on the boat, on the sea conditions, on load distribution, on demanded or effective speed and so on were never taken into consideration. 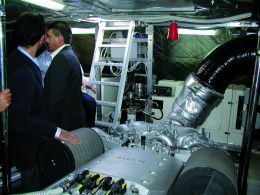 MTU innovation is that "Maritune"'s computer takes on itself the optimal operation not only of the engine but also of the drive so as to obtain the best seakeeping ability and performance. How does it work? It includes two surface drives, with rudders and surface propellers, one for each engine just like on any other boat. But the absolute and very interesting novelty is that the trim tab is automatically set and controlled. This means that anytime, for any maneuver and in any sea condition, the system automatically determines which is the best trim for each of the two propellers and the pilot needs only to use the levers and follow the course: "maritune" takes charge of the rest. If at startup, a greater thrust is needed for planing, "maritune" initially lowers the propellers and then lifts them up little by little as speed increases. If in a tight turn, let us say to the right, the boat tilts - lifting her port side and lowering her starboard side - there is no need to worry: "maritune" lowers the portside propeller and lifts the starboard one so as to maintain the two propellers on the same level under the water surface, thus maximizing thrust. The system is compatible with all propulsion plants equipped with two MTU Series 2000 or 4000 diesel engines within the 1000 to 5000 horsepower range. -in addition to manual control, several types of automatic settings are possible such as: low speed, single lever, dual lever, maneuvering, planing, single engine, etc. -easy installation with the plug & play system. The drive will be launched on the market in 2007. It was installed on the yacht "Tiziana", the MTU boat used as testing ground in Italian waters and has been operating without troubles for over a year of tests and trials. We were invited to go out to sea by the Captain Sergio Martini. With the boat still moored, we gave a look at the propellers under the aft platform grid, where they seemed to lay in ambush. Then we visited the engine room in order to understand how the system is installed and how it works and to take some of the photos appearing in this article. Then we cast off. We slowly moved away from the dock, just outside the Boatshow compounds and we hauled and stored the fenders. Initially the sailing program contemplated maneuvering, which was done by easing the throttle open, causing small changes in engine speed thus preventing sudden accelerations. Then we sailed for quite a long time in trolling mode: again the throttle was opened but never reached full speed. We were simply cruising! Subsequently the Captain switched to total automatic control, set the throttle on full speed and invited us to watch the trim instrument. This instrument showed how precisely and continually the trim tabs varied - without the Captain's interference - in the same direction (when accelerating and slowing down, thus optimizing speed and trim) as well as in opposite directions (when turning to portside or to starboardside). 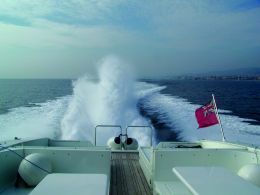 True, the initial acceleration to reach planing speed was not scorching as in the case of offshore hulls, but two things must be considered: 1) "Tiziana" is a 25 meter (82 feet) long yacht with a 50 ton displacement and, even though it is powered by 4000 hp she must come to terms with the considerable amount of inertia and 2) the automatic trimming surface drive plans the engine's RPM increase and manages it together with the trim in real time, so as to avoid fumes and sudden stresses contributing to a smooth ride. As a consequence, the RPM increase is gradual, uniform and faster creating, at high speed, the rooster tail off the stern typical of all surface propellers. What is even more pleasant is the simplicity of maneuvering during turns, even tight ones, and the perceptible stabilizing effect accompanying them deriving from the sensation that the thrust is not modified by possible trim variations. At this point, it is logical to believe in MTU, which declares that with Maritune there is a 10 to 30% reduction in acceleration time and as a consequence considerable fuel saving. On our way back, we chatted with Captain Martini about one thing or another. While the new system works, he looks away from the sea ahead and gives a look at the instruments, with his right hand on the lever and his left hand on the wheel.